Hike and trek to the best views in Jasper, Alberta. JASPER, Alberta – The expansive Canadian Rockies have some of the best trekking opportunities for outdoors enthusiasts and as a mountain man, I dedicate a lot of my time to exploring every hidden corner. Some of the best treks I have taken in Jasper, Alberta were with the Overlander Trekking Company. Even a solitary mountain man enjoys the company of a knowledgeable and friendly guide while trekking the Canadian Rockies wilderness. Before I set out on my first trek with Overlander, I spoke with Trevor who recommended some of the more popular hikes and treks in Jasper National Park. According to Trevor, “In summer, the Mount Edith Cavell Mountain trek is a popular trek. The hike is 6 km long with a 350 m elevation gain. You will see the Angel Glacier and the Lake of Forgiveness.” If you want to see Mother Nature in action, the Lake of Forgiveness is an awe-inspiring newly formed glacial lake that brings geology to life right before your eyes. After a fun day of treking and sightseeing, I always head into Jasper to meet up with some buddies and rehash my adventures. Eventhough I am a mountain man who spends most of his time in the Canadian Rockies widerness, I just never know what kind of surprises – wildlife, crampons, glacial lakes – that I will encounter in Jasper National Park. For More Information on Overlander Trekking: click here! For More Information on Accommodations: click here! 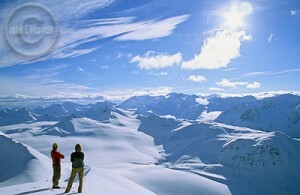 For More Canadian Rockies Attractions: click here!